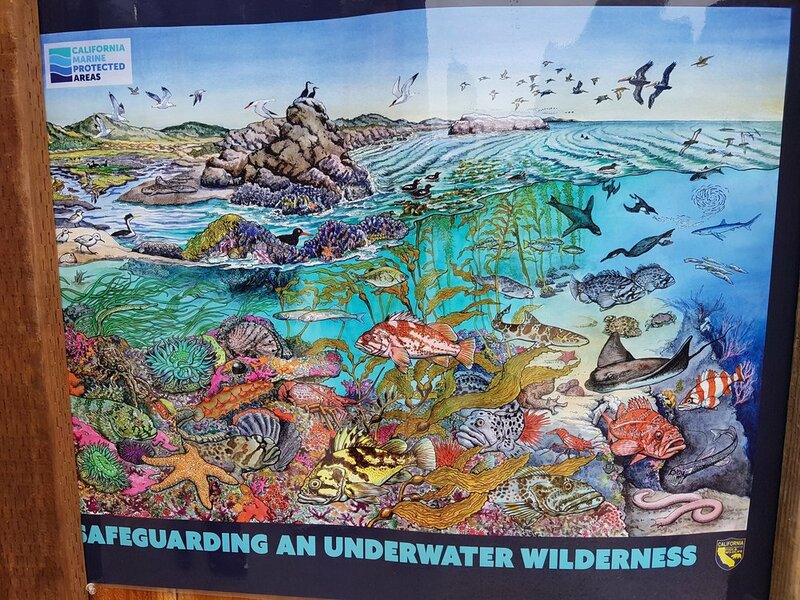 Point Lobos - the jewel in the crown of California's MPAs? I had an awesome morning yesterday. 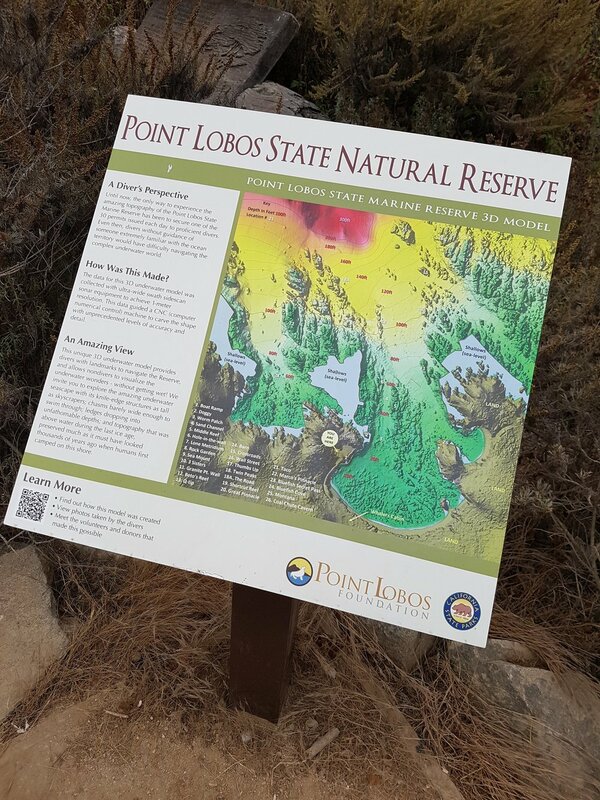 I got to visit Point Lobos State Marine Reserve. It's no exagerration to say that this is one of the most studied, best known marine protected areas in California, if not the United States. And one of the oldest, as I discovered, being first designated as a protected area back in 1960. As part of the state-wide MPA redesign process in the late 1990s (more of that to come), it was expanded and became a full SMR in its own right. Today it forms part of the California Department of State Parks's suite of protected areas, and is visited by over a million visitors each year. I was there early at 9am to meet staff from CA State Parks, Daniel Williford, Pat Clark-Gray and Berndt Stolfi, along with Leandra Lopez from the MPA Collaborative Network. Daniel is an interpreter at Pt Lobos and leader of an online live kayaking and video tour of the kelp forests at Pt Lobos, Pat is a programme manager for interpreation and also co-chair of the Monterey MPA collaborative group (of which more later), Bernd coordinates the PORTs distance learning programme using Daniel's videos to reach children across the state. And last but not least, Leandra helps to coordinate the MPA collaborative groups' outreach activities. What I hadn't realised, and this was from talking to the local docents (guides), that Point Lobos was an industrial place up to the 1920s, with a cannery for abelone, coal mining, forestry, gravel mining, whaling and fishing all going on in and around the bay at one point. It was not until a rich guy by the name of A.M. Allan bought all the coal licensing blocks which ultimately ended up in the hands of the State that the area was safeguarded for its natural beauty. 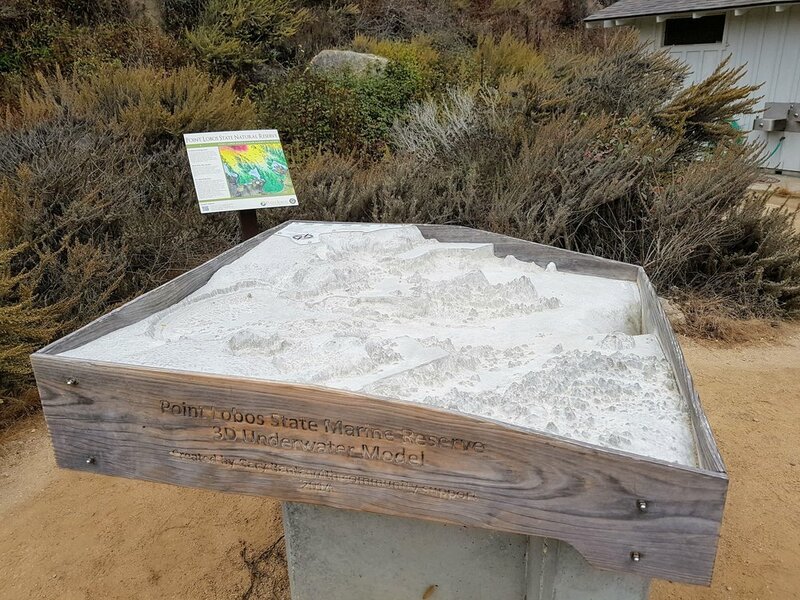 Ca State Parks are one of a number of organisations with either a responsibility or interest in the management of Point Lobos and California's other marine reserves, and obviously have an interest in getting the profile and word of Pt Lobos out there. And in fact, they may be doing too well - with only 150 car spaces and a million visitors a year, people have been parking along the highway and risking their safety to get into the reserve, and the extra pressure has been difficult to manage. One option could be a shuttle bus into the reserve from outside, though this is to be discussed. Daniel with his prize kayak electronic station machine! You could tell that the area had been a no-take zone for 50 years - the water was just so clear and clean and peaceful (I'm hoping to get the chance to dive it later). I was also struck (despite cuts to resources apparently) how much on the ground capacity there is for Pt Lobos, both in terms of rangers and interpretative staff. And in general, the level of resrouce that is available for SMR management. In this instance, it has come from various sources, includiing the California Ocean Protection Council, National Geographic and even funding as mitigation from power plants using water as cooling. The level of philanthropic interest in MPA management is also significantly higher than the UK, a large part of which has focussed on the establishment of the MPA Collaboratives. All this is relative, of course, and we could always use more money and local staff in the UK! We also got the chance to test out a nifty piece of remote camera kit that (when people get the hang of controlling it!) 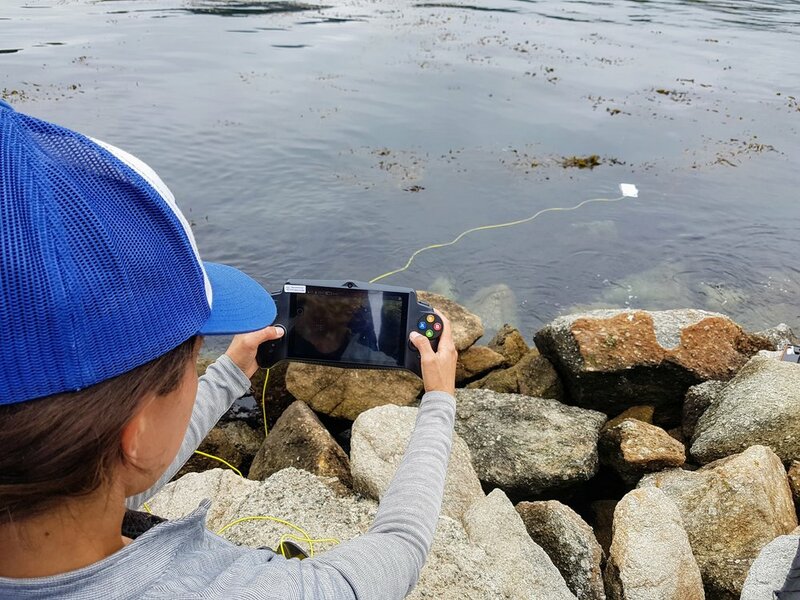 can live stream from underwater to classrooms around the state and beyond. That's thanks to a grant to give 30 of these remove ROVs to groups along the State and support from National Geographic. I must admit to being a bit jealous as the images were really clear - it would be great to have these in the UK.